There are few things that bring the same joy as a homemade s’more perfectly cooked over the fire. I love inviting friends over for s’mores in the backyard, or even better fire roasted kebobs! Firepits are one of my favorite parts of summer. 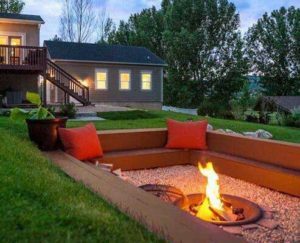 As a child I had to go camping in order to sit around the fire, but now they are one of the most popular additions to backyards everywhere. 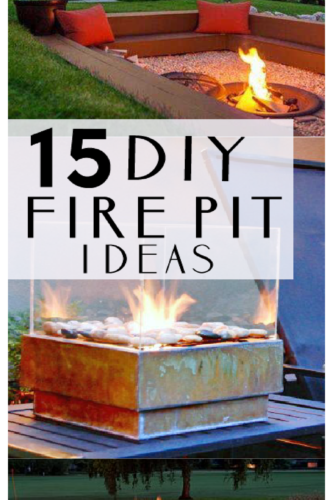 Now, you can even make your own firepit. 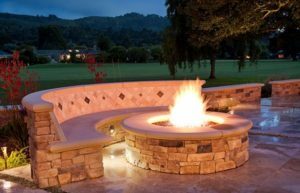 Here are 15 of my favorite backyard firepits you can complete yourself. 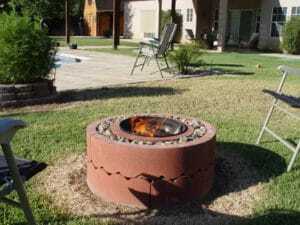 Pavers: This is probably the most popular type of firepit. Using the same pavers you’d use in your landscaping, create a simple circle and you’re done. 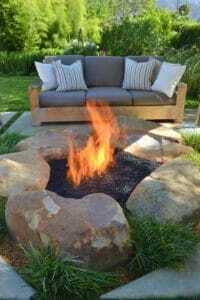 Burning Bowl: Using a large planter, a little quick-set cement, and fuel bowl, you can create a burning bowl that is perfect for a smaller setting made for two. Eco Friendly: By using a natural burning fuel, you can create an environmentally friendly fire that doesn’t use coal or wood. Bricks: If you’re in a hurry, grab a few leftover bricks and create a small tower that is perfect for holding a last-minute backyard barbeque. Table: These basic outdoor tables are fairly inexpensive, and often easy to find secondhand. 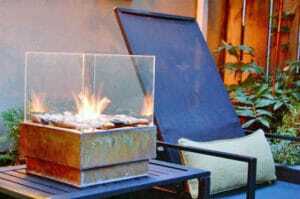 They make a great base for a tabletop fire that you can enjoy with friends and it comes with your own seating. 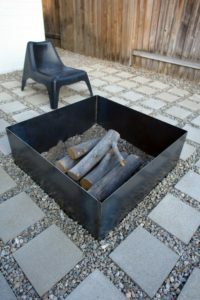 Modern: This more modern style firepit is made with steel sheets welded together to create sleek lines and a minimalist profile that looks and functions perfectly. 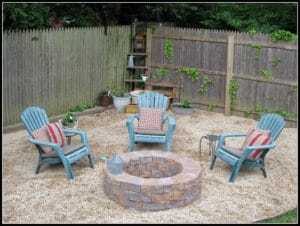 Retaining Wall: For a larger firepit, use retaining wall blocks instead of pavers. It creates a beautiful look and come in a variety of colors and textures to match your landscape. Glass: This fire is as beautiful as it gets set atop glass beads that emit a beautiful blue glow when they are hot. I could stare at this one for hours. 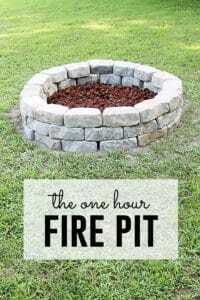 One-Hour: Not all projects have to take all weekend, this backyard firepit is completely done, start to finish in just one hour! 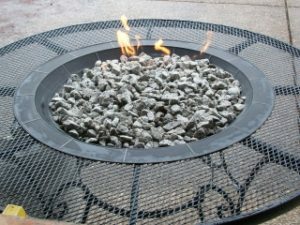 Tabletop: If you prefer fire more for the ambiance, consider a side table firepit you can create on your own. 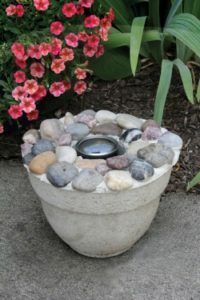 It is beautiful and relaxing for any outdoor setting. 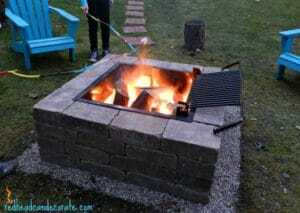 Grill Fixture: For grill enthusiasts, this DIY firepit comes with complete instructions on attaching a grill kit so you’re ready for a cookout anytime. 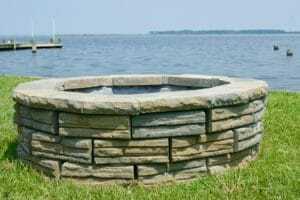 Tree Rings: Using premade tree rings is a great way to create a circular firepit without having to measure and level out pavers. 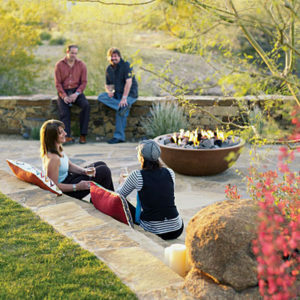 Natural Rocks: For a more rustic style, use large landscape rocks and create a firepit that is easy to use and completely natural looking. Seating Included: This project might take more than a few days to complete, but it is completely breathtaking. Inset Fireplace: This might be my most favorite fire pit in the history of ever. Complete with plenty of seating, a comfortable space, and the perfect cozy setting for cool summer nights. 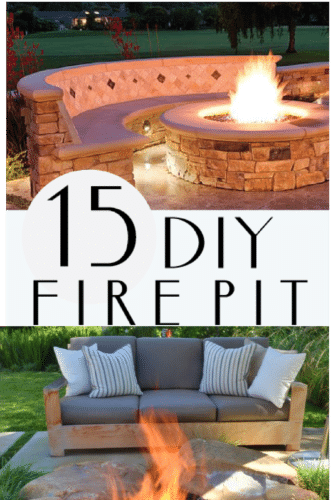 I hope this has inspired you to try your hand at your own DIY firepit, and enjoy the summer!